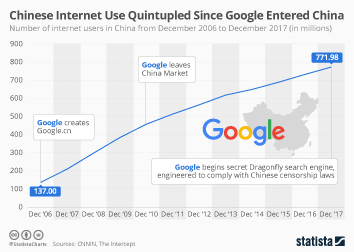 China had 564 million netizens as of December 2012, accounting for more than one-fifth of the world’s population of internet users. This puts China’s total internet penetration at 42.1 percent. The number of users, who accessed the internet from their mobile phones reached nearly 356 million as of 2011. Instant messaging ranked first in online activities with 415 million users, followed by search engine usage, and listening to online music. As of 2011, internet users spent an average of 13 hours watching online videos, 4.5 hours listening to online music and 4.5 hours playing online games during the week. As of 2011, Tencent was the leading internet company in China ranked by revenue, market value, and total unique visitors. Baidu, placed second, generated 2.3 billion U.S dollars revenue and had a market value of 38.8 billion U.S. dollars. With a market share of 61 percent, calculated by visits, Baidu is the leading search engine in China as of October 2012. More information on global internet usage can be found here. More interesting topics from the industry "Demographics & Use"